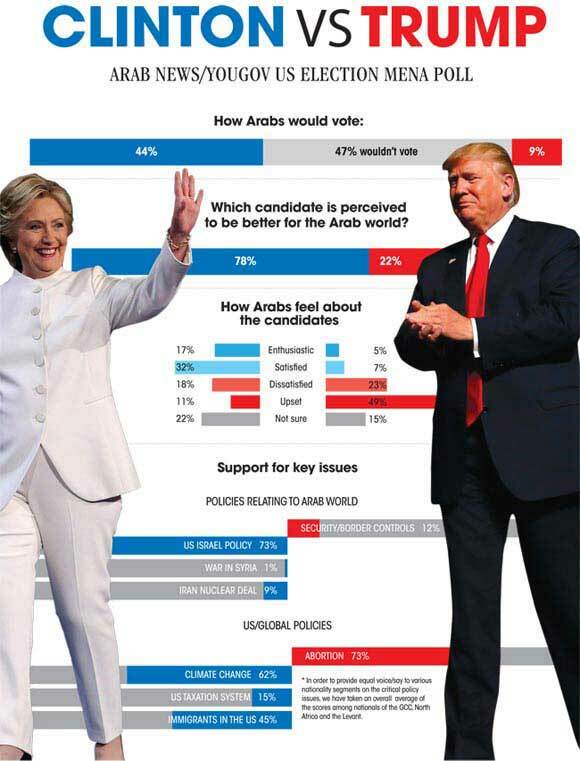 Hillary Clinton proved to be the most popular candidate, with 44% of Arab respondents saying they would vote for the Democratic nominee, compared to 9% who would vote for Donald Trump. But when questioned on Trump’s key policies – although without the candidate being named – Arab audiences broadly agreed with his stance on abortion, security and border controls. Hillary Clinton’s line on climate change, immigrants in the United States, and US Israel policy found favor among citizens of the Middle East and North Africa. Yet people in the region were split equally over the candidates’ viewpoints on divisive issues like the war in Syria or Iran nuclear deal.